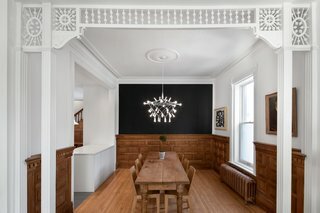 The client for this project was raised in this 1890's brick Victorian. When the client's mother passed away, she and her family decided to move back in and engaged RobitailleCurtis to assist them in modernizing the kitchen. In the end, RC renovated the entry hall, dining room, and kitchen as well as relocated the rear service stair, the basement stair, and the powder room. We were careful to respect this historic detailing of the home while improving visual connections and circulation between adjacent spaces on the ground floor. A larger more functional, modern, eat-in kitchen resulted as well. RobitailleCurtis uploaded Winchester Residence through Add A Home. Renovated dining room with newly expanded opening to kitchen. View from the entry & stair hall to the new kitchen beyond. The kitchen in the Winchester Residence features plywood cabinets with white Fenix cladding. RobitailleCurtis moved the rear service stair forward into the kitchen to allow a new stair to the basement to be concealed beneath it. Custom cabinetry was designed by RobitailleCurtis, built by Kastella. View from the kitchen into the dining room. Detail of plywood cabinets clad in white Fenix. Cabinets designed by RobitailleCurtis, built by Kastella. Detail of custom cabinets designed by RobitailleCurtis, built by Kastella. The front facade of this charming 1890's brick Victorian located in the Westmount neighborhood of Montreal. RobitailleCurtis's office is just around the corner on Victoria Ave.
View before the renovations from the stair & entry hall looking toward the kitchen entry and the powder room. A view from the dining room into the kitchen before the renovations. A view of the kitchen looking back toward the entry hall before the renovations.